After 2019 this trend is expected to reverse. Benefits payable to retirees will be greater than revenues from payroll taxes. When this happens the funds must use its excess reserves to pay benefits. 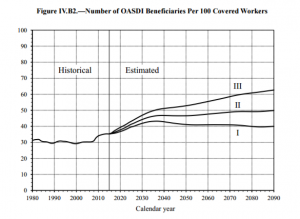 The trustees project that there are sufficient reserves to pay out 100% of promised benefits until 2034. After that tax receipts will only be able to pay 75% of promised benefits. This is the case until the very end of the trustees’ projection period, which goes out until 2090. As you probably know, a lot of this has to do with our aging society. Social Security is a “pay-as-you-go” system. That means that current payroll taxes are used to fund current benefits. When the number of people receiving benefits outweighs the number of people paying into the system, there’s an outflow of reserves and more “stress” is put on the system. With 10,000 baby boomers reaching age 65 every single day, the fund’s outflows are increasing faster than it’s inflows. Also from the trustees’ most recent report. The ratio of those receiving benefits to those paying benefits is rising. Long story short, we’ll need to make changes to the Social Security system in order to continue paying out 100% of promised benefits to retirees. To check in on the current status of Social Security and what reforms might be on the table, I was able to talk the veritable Ben Brandt into sharing some of his wisdom. Ben is the founder of Capital City Wealth Management, which is based in Bismarck, North Dakota. He is also a fellow fee-only CERTIFIED FINANCIAL PLANNER® and host of the popular podcast Retirement Starts Today Radio. (Be sure to check out my guest appearance in episode 20, where we chat about the 4% withdrawal rule). Additionally Ben teaches an adult education course on Social Security, and is uniquely qualified on the topic. Ben, what are your thoughts on the current state of Social Security? Something will eventually need to be done to shore up the system. We’re still seeing our representation kick the can down the road when it comes to Social Security. The trustees project that we’ll be fully funded until 2034, and 75% funded thereafter. What we also need to consider is that their reports are heavily driven by the state of the economy. They’re making their projections based on current receipts from payroll taxes. When the economy is good, more people are working. And with a larger labor pool the Social Security fund collects more in tax receipts. This makes the projections look good. But when the economy slows down and unemployment picks up, the projections tend to be hit pretty hard. 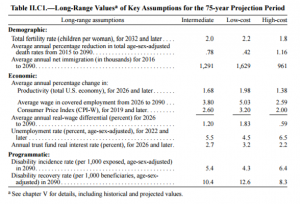 The projections are actually highlighted on Social Security benefit statements too, in case anyone’s wondering where they can find the research. So, are you saying that Social Security is actually in worse shape than the trustees report, since unemployment is currently so low? Does that mean that people currently receiving, or are about to file for benefits might have them cut? I think the likelihood of that happening is pretty low. Anyone currently retired or about to retire was promised a certain amount of benefits in exchange for paying a certain amount of tax through their payrolls. Politically, it’s problematic to rescind that promise. Instead, I think it’s more likely that changes would be enforced on younger workers. Those newer to the workforce aren’t as entrenched in their retirement plans. Telling someone 5 or 10 years away from retirement that their benefits will be reduced 15% could blow up their entire plan. But someone with a 35 year career ahead of them has plenty of time to adjust. Plus, it’s just not necessary to make that drastic of a change yet. If we act soon, we can fix the shortfall by making a few minor tweaks here and there – without affecting current retirees. Let’s move on from the doomsday scenarios. If we know there’s a significant shortfall coming, what can we do to fix it? There are a few levers we can pull. One is to increase the cash coming into the system, the other is to decrease the cash exiting the system. As you can imagine, this discussion is highly political. Democrats want to boost the cash coming into the Social Security fund by raising taxes, Republicans want to reduce the cash leaving the fund by cutting benefits. From the Democrats perspective, there are a couple ways they could raise taxes. The first would be to simply raise the percentage tax that we all pay out of our earnings. Currently employees pay 6.2%, which is matched by their employers (self-employed people have the privilege of paying the entire 12.4% themselves). Raising this amount would be a simple way to raise revenue. The second option is to increase or eliminate the wage base. While you’re working, you only pay FICA (or SECA for the self-employed) tax on the first $127,200 of your earnings. This was just increased from $118,500 on January 1st, by the way. Anything you make above that isn’t subject to OASDI taxation. By subjecting more of your or all of your earnings to taxation, we’d increase the cash coming into the system. There are problems with this tactic too though. For example if we eliminate the wage base entirely, people like Warren Buffett and Bill Gates would accrue Social Security benefits based on huge amounts of income. That would mean they could eventually collect tens, maybe even hundreds, of thousands of dollars each month in benefits. Yes, they would have earned them by paying so much into the system, but Social Security is supposed to be a safety net. Not an annuity for rich people. Isn’t that the purpose of “Bend Points”? That means that lower income workers might receive 90% of their working wage in benefits. Meanwhile, higher income workers only receive 15% of any monthly earnings over $5,336 ($885 + $4,451). Long story short, the way around this issue would be to incorporate more bend points if we were to increase the wage base. The Republicans would prefer to reduce the amount of money leaving the fund. And again, there hasn’t been any talk on Capitol Hill about slashing the benefits that people have already accrued. Instead, most of the talk has revolved around making changes that would apply to younger people entering the workforce. The three options being floated are raising the retirement age, changing how the primary insurance amount is calculated, or reducing cost of living adjustments. Sam Johnson, a U.S. representative from Texas recently released a proposal that incorporated a higher retirement age and a different PIA calculation. He wants to raise younger people’s retirement age to 69, and allow them to accrue delayed retirement credits up until age 72. This is the most formalized version of a reform proposal I’ve seen recently. What’s the likelihood that any of these changes will actually happen? How does our new president play into all this? Right now the Republicans control both the house and the senate. And with Mr. Trump taking office it seems impossible that the Democrats would be successful in their efforts to raise taxes or the wage base. It seems like Trump has many other things on his immediate agenda that take precedent over Social Security reform too. He’s said several times on the campaign trail that he doesn’t want to touch Social Security at all, but who knows how it will play out. His path to reforming the program looks pretty wide with a Republican controlled Senate, and the opportunity may be too good to pass up. We talked about putting more money into the Social Security fund and taking less money out. What about investing the cash currently in the fund more aggressively? Wouldn’t growing our current reserves faster help? Theoretically yes, but I don’t think that would ever happen. Currently the reserves in the fund are invested in U.S. government bonds. I don’t believe U.S. taxpayers would be too happy if the government decided to take more risk with their tax money by investing it in something like the stock market. Yes we might be able to make up the shortfall through better investment returns, but the impact could be pretty bad if the fund had negative returns. An alternative that some people have discussed is allowing people who are fully insured to have investment discretion over their contributions to the Social Security fund. This would be kind of like a government 401(k), where you’re taxed from your payroll automatically but could invest more aggressively if you chose. This introduces a lot of risk to peoples’ well being though, and hasn’t gained any traction. What’s your best guess as to what changes we’ll see in Social Security over the next 10 years? At some point someone will need to intervene and make some changes. Like I mentioned before, politicians today are prone to kicking the can down the road, but eventually our representatives will need to step in. I’m no political expert, but how exactly we reform the system would surely come down to the composition of our government at the time. I can see the republicans pursue their agenda in the next four years, but then again maybe not. Either way, I think people who are currently retired and receiving benefits are unlikely the amount of their monthly check change. Anything else you’d like to leave readers with? Make sure to integrate your benefits into a comprehensive financial plan. Don’t make your claiming decision in isolation. Thanks Ben for your time and thoughtful input! Be sure to check out Ben’s podcast and blog over at retirementstartstoday.com. Posted in Financial Planning, Retirement and tagged sam johnson social security, soc sec, social security, social security reform, social security reform options, trump social security.